The antibody recognises an antigenic determinant common to HLA A, B and C. In WB, it detects the heavy chain of MHC molecule. We have data to indicate that this antibody may not cross react with Rabbit. However, this has not been conclusively tested and expression levels may vary in certain cell lines/tissues. Tissue/ cell preparation - Membrane of human tonsil cells. The antibody recognises virtually all nucleated human cells, it is a valuable reagent for analysing variations in HLA class I expression in different disease states e.g. liver disease, muscular dystrophy, inflammatory myopathy and other neuromuscular disorders. 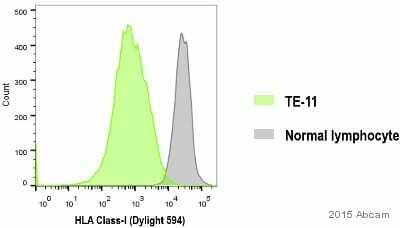 This antibody is also suitable as a positive control for HLA tissue typing and crossmatching. Our Abpromise guarantee covers the use of ab23755 in the following tested applications. Paraformaldehyde or methanol fixed cells. WB 1/250. Use under non reducing condition. Detects a band of approximately 45 kDa (predicted molecular weight: 31 kDa). Overlay histogram showing Jurkat cells stained with ab23755 (red line). 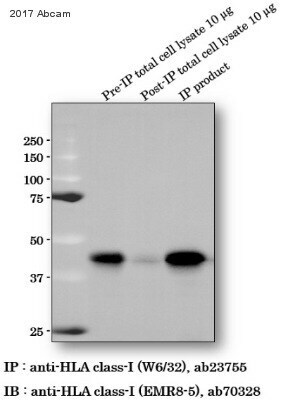 The cells were fixed with 4% paraformaldehyde (10 min) and incubated in 1x PBS / 10% normal goat serum / 0.3M glycine to block non-specific protein-protein interactions. The cells were then incubated with the antibody (ab23755, 1µg/1x106 cells) for 30 min at 22°C. The secondary antibody used was DyLight® 488 goat anti-mouse IgG (H+L) (ab96879) at 1/500 dilution for 30 min at 22°C. Isotype control antibody (black line) was mouse IgG2a [ICIGG2A] (ab91361, 2µg/1x106 cells) used under the same conditions. Acquisition of >5,000 events was performed. This antibody gave a positive signal in Jurkat cells fixed with methanol (5 min) used under the same conditions. ICC/IF image of ab23755 stained HeLa cells. The cells were 4% formaldehyde fixed (10 min) and then incubated in 1%BSA / 10% normal goat serum / 0.3M glycine in 0.1% PBS-Tween for 1h to permeabilise the cells and block non-specific protein-protein interactions. The cells were then incubated with the antibody (ab23755, 1µg/ml) overnight at +4°C. The secondary antibody (green) was Alexa Fluor® 488 goat anti-mouse IgG (H+L) used at a 1/1000 dilution for 1h. Alexa Fluor® 594 WGA was used to label plasma membranes (red) at a 1/200 dilution for 1h. DAPI was used to stain the cell nuclei (blue) at a concentration of 1.43µM. Publishing research using ab23755? Please let us know so that we can cite the reference in this datasheet. I was using your Anti-HLA Class I [W6/32] antibody (ab23755) to stain SiHa cells and investigated them under the confocal microscope. The staining that I got looked pretty much like plasma membrane staining. Now, I was wondering whether the antibody does not recognise intracellular HLA (e.g. that is still in the Golgi) when using for IF? Does it only recognise the mature form in the cell surface? I have received a reply from the lab who confirm that we have tested only cell surface binding of this antibody (which was good), not intracellular binding. Currently we do not have data regarding its reactivity with premature antigen. However, for your experiments I suggest to use also other similar transmembrane proteins as a positive control to check the GA compartment is accessible well for the antibody staining. I am currently trying to find an anti-human-HLA class I antibody that does not bind to human HLA-G. At the moment, I have an anti-human-HLA-A/B/C antibody that does bind human HLA-G and as I am wanting to do some double staining, this is skewing my experiments. Do you know if any of your anti-human-HLA class I antibodies do not bind human-HLA-G? If you don't know, would it be possible for you to send me a sample of an APC-conjugated anti-human-HLA class I antibody for me to test? This antibody reacts with all human classical MHC Class I molecules in native cell-surface forms as well as with human HLA-G cDNA transfected cells. This antibody completely blocks the binding of pan MHC antibody (ab7855) but does not block binding of anti-HLA-G (ab7758/7904) to surface-expressed HLA-G. While many of the HLA Class I products are created from tissue preparation and have not been epitope mapped, I have contacted the lab to determine whether the peptide immunogen used to create ab134743 is from a region which differs from HLA-G. I will let you know the result of that query. Because we carry over 70,000 products, it isn't feasible for us to keep small sample sizes of our products. We are happy to reassure our customers that all of our products are covered by our Abpromise, which guarantees that the product will work in the applications and species specified on the datasheet, or we will offer a replacement, credit, or refund within 6 months of purchase. Regrettably, as this is not currently a standard application, we are not able to offer our testing discount on this occasion. Also, you can obtain further reward by submitting an Abreview about this product via the online product datasheet. We always encourage customers to send their results back to us, whether positive or negative, and we make all product information available to researchers. I hope this will be helpful. Thank you for your time and effort. Kievits F, Ivanyi P: Monomorphic anti-HLA monoclonal antibody (W6/32) recognizes polymorphic H-2 heavy-chain determinants exposed by association with bovine or human but not murine beta 2-microglobulin.Hum Immunol. 1987 Oct;20(2):115-26. Inquiry: Question 4 in scientific support for this product was a person asking if they could test this antibody in paraffin embedded sections. Can you tell me if the person had success with this? Also, I was somewhat confused since the person wanted to test rat tissue, when this is meant for human MHC class I molecules. Yes, we did offer that customer a discount to test the antibody in rat in IHC-P. We have a testing discount program where customers can purchase an antibody risk-free to try in their novel species and/or application. It's essentially buy-one-get-one free where you purchase the antibody, test it in the untested species or application, submit an Abreview with the data whether positive or negative, and get a discount code for 1 free antibody off a future purchase within 4 months. Unfortunately it appears that this customer never got back to us with the data, so I do not know his/her results. Testing discount code for ab23755 to try in mouse. I am very pleased to hear you would like to accept our offer and test ab23755 in mouse tissue. This code will give you: 1 free PRIMARY ANTIBODY before the expiration date. To redeem this offer, please submit an Abreview for mouse tissue and include this code in the “Additional Comments” section so we know the Abreview is for this promotion. For more information on how to submit an Abreview, please visit the site: www.abcam.com/Abreviews. Thank you for your response. Lysates from Jurkat or HeLa cells or from human tonsil tissue can be used as positive control. Currently, we have do not have HLA Class I over-expression cell lysate in our catalogue. It may be worth optimizing the working concentration/dilution of this antibody to get stronger band on the blot. I hope this helps and if I can assist further, please do not hesitate to contact me.